Liberty Intl. - Hewanorra Intl. Best hotel in the area We absolutely loved it! Breakfast was incredible. We stayed in ac room near beach. 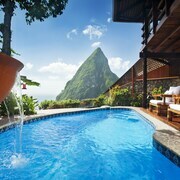 Had to walk up and down stairs and it is very hot and humid in the carribean so be prepared. Recommend the snorkeling sail. 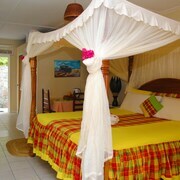 These guest house accommodations are located throughout the area in Soufriere. 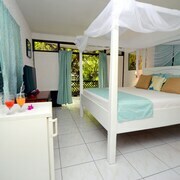 Excellent room for honeymooners and nature lovers. I chose this resort to impressed my wife for our honeymoon. 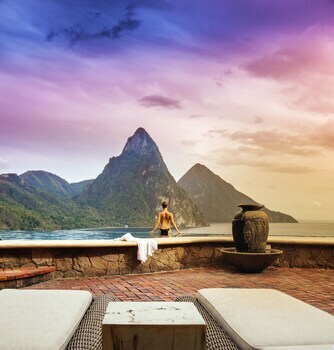 She was very happy and speechless at first sight of the pitons from our room. You need not strike it rich on the lottery or be sitting on a trust fund to spread your wings and see the world. 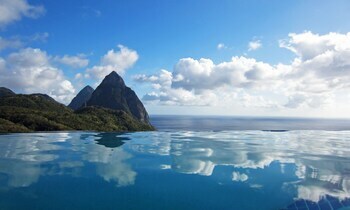 It's time you traveled the fantastically frugal way through Soufriere! 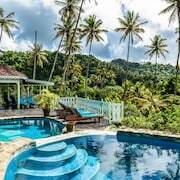 It lies roughly 11 miles southwest of Castries, the national capital, and 11 miles southwest of Castries. 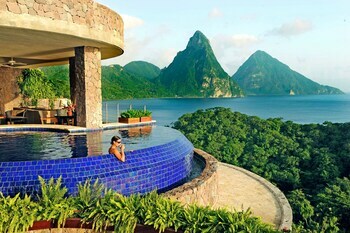 The population of this area of St. Lucia is around 3,000. 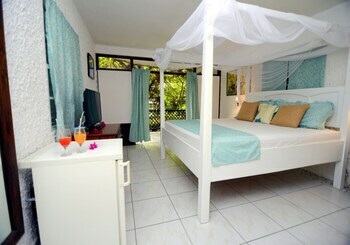 You don't need to be an art snob to have an awesome time at the Choiseul Arts and Crafts Centre. Check out their upcoming program to pick one of the free or cheap arts and culture events. We all know that simply being next to water makes us happy and relaxed. So why not swap the swift pace of sightseeing for a few hours of peaceful bliss at River Rock Waterfall, Piton Falls and Toraille Waterfall? Could you do with a quiet moment of self-reflection to take a break from the fast pace of sightseeing? Stop by Church of the Assumption! If you'd like to have a look inside, check its opening hours before you go just to be safe. Looking for shapes in the clouds while sitting back on the shore is a leisurely way to spend an afternoon. 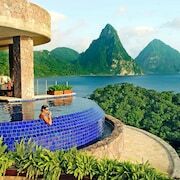 Anse Chastanet Beach, Jalousie Beach and Anse Cochon Beach are some prime coastal areas to pick from. 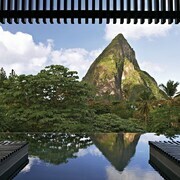 Grab a camera and appreciate the area's most impressive natural sights at Soufriere Volcano, Petit Piton, Tet Paul Nature Trail and Gros Piton. Here at CheapTickets, you won't have to stress out about pocketing the best price. We've got it all covered for you, and we haven't compromised on quality for accommodations, flights and incredible experiences. Some might think traveling on the cheap means sacrificing choices, but with us it's quite the opposite. With 500 partner airlines and around 500,000 properties internationally, you'll have a world of choice. And if you combine your bookings on flights and hotels, you could save as much as $481. Let your inner cheapskate breathe freely with the CheapTickets Price Guarantee. Here's the lowdown — if within 48 hours you stumble upon your package for less, we'll meet it and refund you the difference. How's that for penny pinching! We know how difficult it is parting with your hard-earned money; that's why we created our simple rewards program. Just for booking your flight, you'll have real savings to use toward your next qualifying CheapTickets hotel reservation. You're just a few clicks away from experiencing the benefits. You'll save on all eligible bookings, not to mention extra scrimpy perks and bonus offers that are guaranteed to make your day. Just log in or sign up for free, join CheapCash and you're on your way! How's this for value for money? Driving a rental car in Soufriere won't only be easier on your wallet, it'll give you freedom as well. You'll be able to go to wherever takes your fancy and see a lot more than you would if you just caught a bus or a train. Make a transfer right from your plane into your car at Hewanorra International Airport. Check out Fox Rental Cars and NÜ Car Rentals. Book today for some red hot deals. 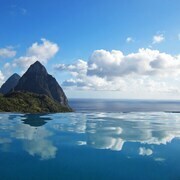 CheapTickets presently lists 32 hotels in Soufriere. Are you eager to spend your dollars on fun things like mouthwatering meals and sensational experiences? Then peruse some of our budget picks, like The Yellow Palm and the Leisure Inn.